Create Loose Leash Walking Now! There are many leash walking tools on the market today. It can be difficult to know which tools are humane, safe and positive for your dog. We want people to have fun with walking their dog and with dog training. Salt Lake City has many places to walk with your dog on leash. As a result we created a list of the best apparatuses on the market that can lessen leash pulling and create obedience. 1.) Head Collars are awesome and give ultimate control. There are some dogs that shut down or become overly aroused when they wear a head collar so it isn’t for every dog. It is best to try the other devices below first and to use a head collar as a last resort. If your dog becomes highly stressed while wearing a head collar, it is best to use a different tool. The Halti, the Gentle Leader, and the Comfort Head Collar are all awesome. These head collars put pressure around your dog’s muzzle when he pulls. This is a bit unpleasant and can be used as an awesome training tool. If your dog has aggression issues, I recommend that you have safety strap that attaches from the head collar to your dog’s flat collar. I also recommend using the gentle leader as it is stronger than the Halti and Comfort Head Collar. Lastly, they make Gentle Leaders that have a buckle rather than a snap which is stronger for aggressive dogs as a the snap can easily break under pressure. 2.) The New Trix Head Collar is a bit different than the other head collars listed above. This collar puts pressure on the back of the dog’s neck which feels minorly unpleasant. The collar works against the dog’s opposition reflex. 3.) A front hook harness can work amazing for most dogs. We love the Easy Walk Harness and the SENSE-ation Harness. The leash is hooked on the chest of the dog, and when the dog pulls on his leash, he is pulled a bit off-balance. This again can encourage loose leash walking with some dog training. Salt Lake City sells them at many pet stores such as Petsmart and Petco. 4.) The Freedom Harness is great for strong dogs. The leash hooks on the chest of the dog and also has a back hook as well. It is great to have this double security. The above are my favorite positive leash walking tools for dog training. 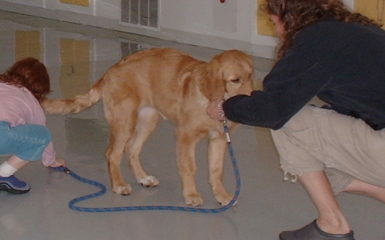 Salt Lake City has many dog trainers that can support you in teaching you how to use these tools. 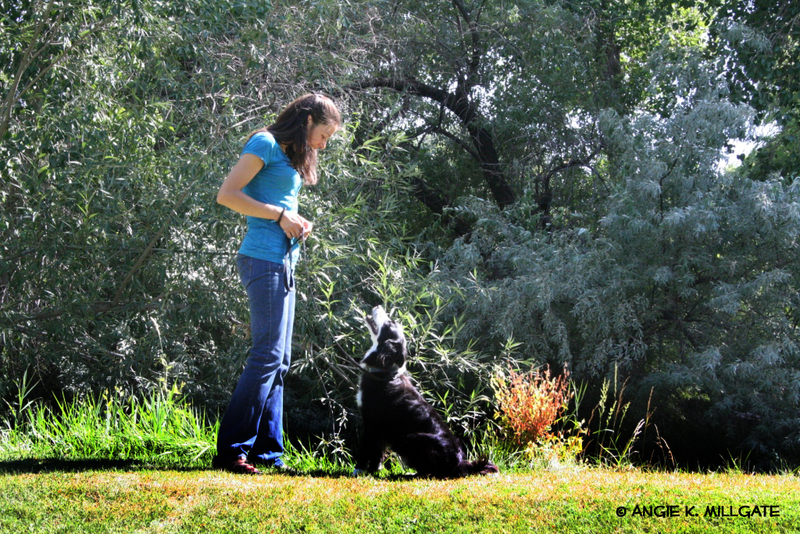 It is important that you use a dog trainer that uses positive reinforcement. It is best to stay away from leash walking tools that use pain as a motivator. These include harnesses that put pressure on the side of your dog, choke collars, prong collars, shock collars etc. 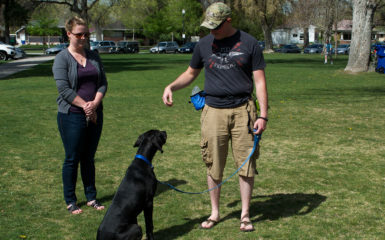 If you are confused on which apparatuses to use for your dog, consult our Salt Lake City dog training company. 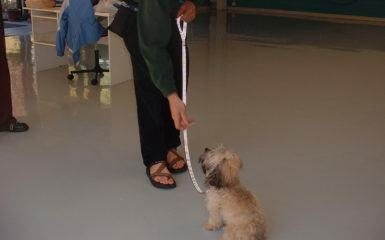 We also have an upcoming leash walking course to support your dog with obedience on leash walks. What tools have you used in the past to train loose leash walking? What new tools did you learn about from the above post? We are super excited to hear about your loose leash walks and experiences with dog training. 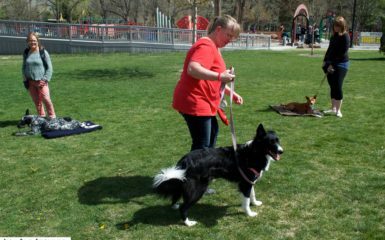 Salt Lake City has awesome on-leash parks including Sugarhouse, Murray, and Liberty Parks where you can enjoy walking your dog.